The 24 Hour Comic Blog has a promo video for the 24-Hour Drawpocalypse in Portland, OR that will be on April 5th. 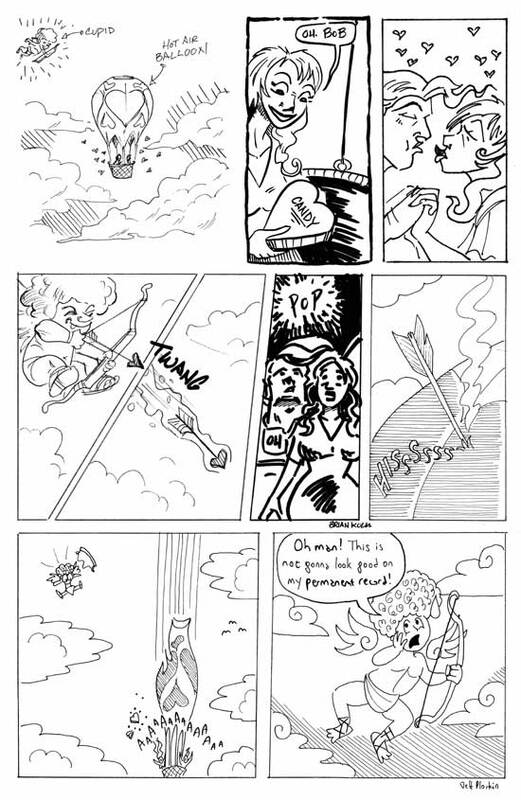 The video shows what the creation of a 24 hour comic book would look like. Fun stuff. Our next meeting will take place 7:00 pm on 4/10/08 and it will be a very special one. We will be bidding Gypsy-Maria Lorimer a fond farewell as she moves to Twin Cities. As per usual, the meeting will take place at the VAS Littlecrow studios (formerly known as the Rice Print Shop,) 310 Division St S, Rice, MN 56367. For directions, call 320-492-0475 or email vanesaATvaslittlecrowDOTcom. Free pizza, goodies and cartoony fun will be had! See you there. 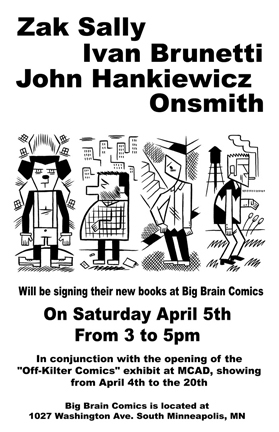 There will be a signing at Big Brain Comics for some of the artists featured in the Off-Kilter event I posted the press release for the other day… see the below flier for the scoop. 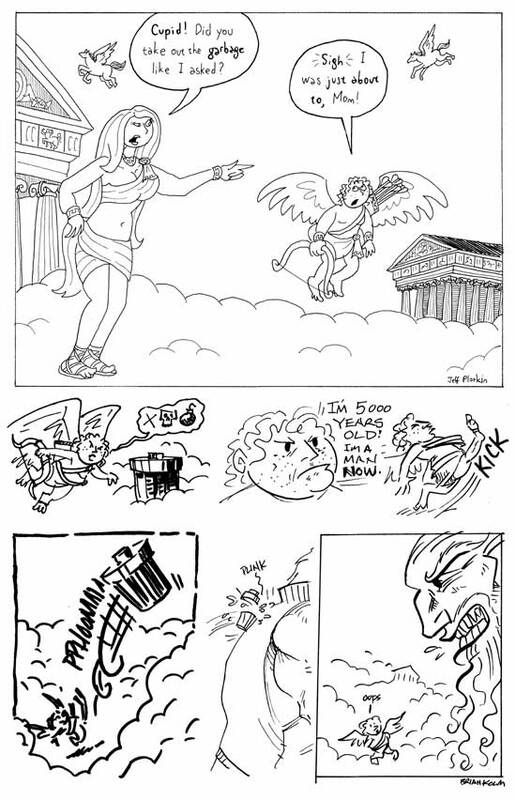 Also note that featured artist Zak Sally was just mentioned in The Comics Reporter’s new Best of 2007 list twice. 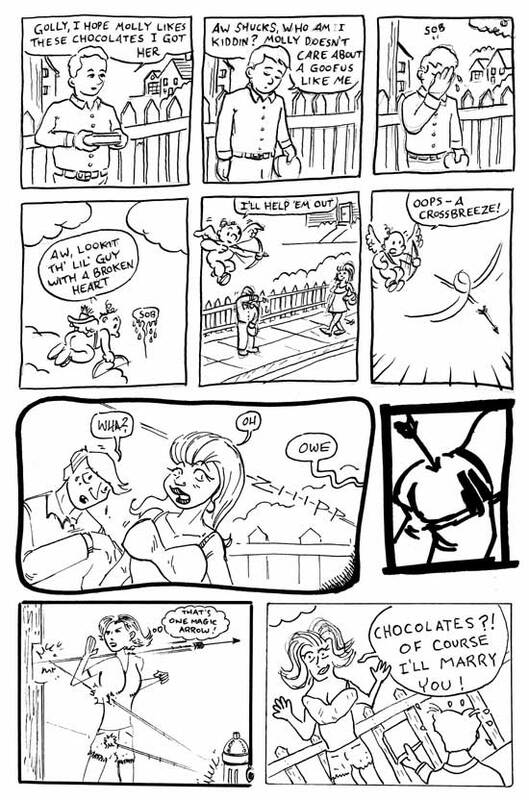 Last month a few folks did not have romantic evenings planned got together to do a Comic Jam on Valentines Day. Each page had to have the same prop, a box of candy, and some of us tried to very our drawing style every panel. We also each drew half a page and each page is a contained story. 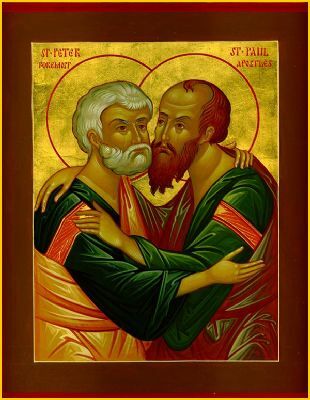 Click on the images to see a bigger image. Well it’s hard to believe that March is coming to and end and a quarter of 2008 is gone, but the great part is that our Comic Jams have been getting bigger and better this year. But we want even more people, so grab your favorite drawing tools and head on down to the Church St. Café at 6:30 pm this Thursday and draw with us. You’ll be glad you did, or possibly amused you did. The April 7000 BC meeting will be held in Santa Fe at Backroads Pizza (807 2nd St # 1), moving across the street to Second Street Brewery after 2:00. 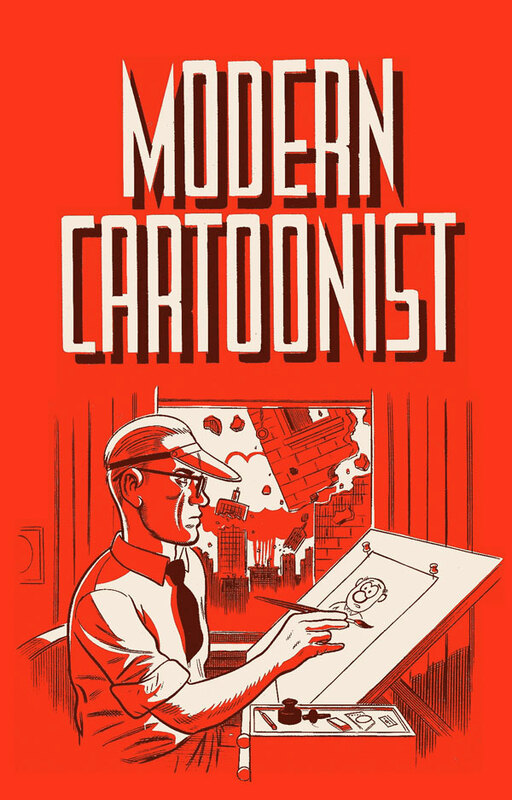 Modern Cartoonist: The Naked Truth, written by Daniel Clowes. Fantagraphics has posted an essay by Daniel Clowes originally appearing as a bound-in booklet accompanying Eightball #18, originally published in 1997. Some interesting reading on modern comics and what they are and can be. It’s very cool that the whole book is hand lettered and illustrated in lovely two color illustrations. 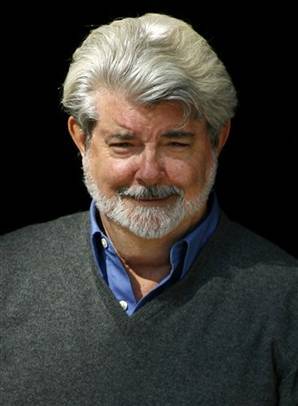 George Lucas Embraces St. Paul . . .
. . . why haven’t you? Join them April 17, 2008 from 6:30PM until 9:30PM. Bring your Midi-Chlorians. Paper will be provided. have started making higher quality books with a lower print run. Mention the CARTOONIST CONSPIRACY to waive the supply fee.